My family and I had just come up from a dive at a site called Aquarius. Underwater is beautiful but above can’t be beat either. Underwater the shallow sandy shelf extends out many feet; this gives the water an incredible turquoise color with shades of emerald and cobalt. Past the shelf, it drops off into the depths and the deep blue takes over. The first panel is just the beach and sea. Far in the distance, the highest point on Bonaire, Mt Branderis, can be seen in the middle panel. 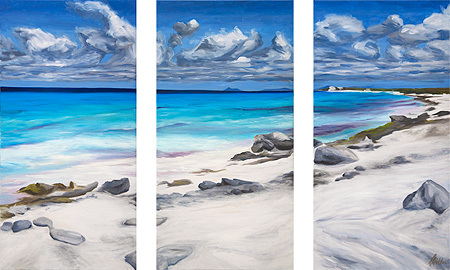 In the third panel, the land curves around with a narrow belt of sand and coral rock. The panels are individually framed in a black metal. Only sold as together.